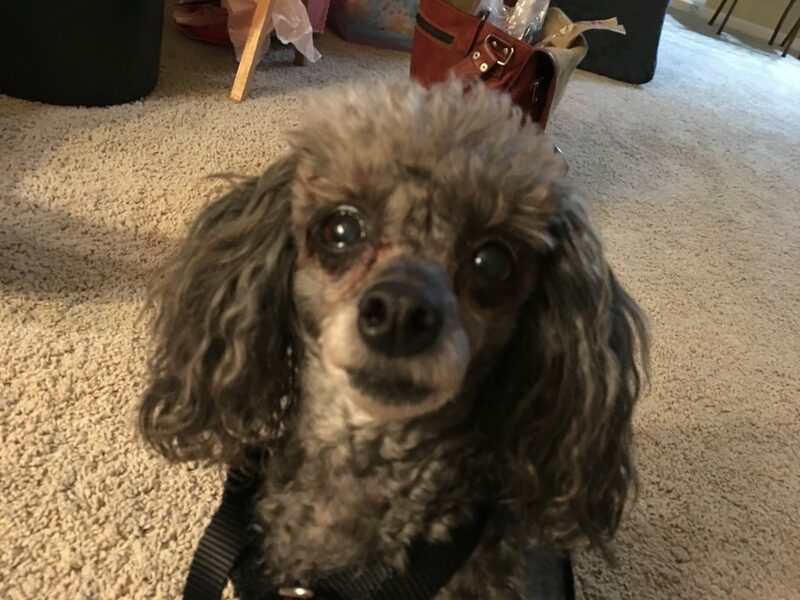 Baxter is a ten-year-old Toy Poodle who lives in South Omaha. His guardians set up a dog behavior training session with me to stop aggressive possessive behavior towards the guardian’s husband when he touches her or gets close when the dog is nearby. Baxter was in his kennel when I arrived for the session. He was extremely animated when I arrived so I knelt down and offered my hand so he could give me a sniff. But poor Baxter was so worked up he couldn’t do anything other than bark and lunge. I waited a few moments to let Baxter calm down on his own. I didn’t want to let him out of his kennel in such an excited and unbalanced state. Unfortunately after a couple of minutes, Baxter had only slightly calmed down. I spent a couple of minutes showing his guardian a way that she can help the dog return to a calm and balanced state of mind before letting him exit the kennel. It took longer than usual, but when we did let Baxter out of the kennel, he did so in a calm and balanced frame of mind. I recommended that the guardians start practicing the same ritual every time they let Baxter out of the kennel. This sort of kennel training can help Baxter with his overall control. After we wrapped up the kennel training discussion, the guardian and I took a seat on the couch to chat about the problems they wanted to resolve in this session. Before we got too deep into that conversation, I made a few recommendations that will help when the families first child comes home from the hospital a little over a month from now. I also recommended that they check out this article that I wrote for the Omaha world Herald a few months ago. The article includes a number of tips and suggestions that will help the dog deal with the arrival of the family’s first child at the end of the month. After we wrapped up the pregnancy tips and suggestions, the conversation returned to the here and now. I learned that his guardian had adopted Baxter as a puppy and lived with him for eight years prior to meeting her husband. Because she had not incorporated many rules or structure into his day-to-day life, Im pretty sure that Baxter had gotten the impression that he had the same authority as his human. If a dog see’s you as a peer, than listening to you becomes optional. But making the situation even more confusing, Baxter’s guardian had gotten into a habit of petting him every time he jumped on her lap, nudged or pawed at her for attention. Over time this combination had given Baxter the impression that his guardian was his mate or girl friend. Fast forward to two years ago when the guardian started to date a man who she eventually married. Because of the lack of discipline and structure, Baxter saw this new person as a challenge to the relationship he had established with his guardian over the last eight years. As a result of this perception, any time that the husband approached his wife when she was with the dog, Baxter reacted. Any time that the husband touched his wife’s pregnant belly, Baxter reacted even stronger. Many humans mistakenly think that because we feed them, nurture them and provide them with a home – dogs automatically see us as an authority figure. But for dogs it’s all about how we act not what we think. In order to stop Baxter’s aggression, it will be important for his primary guardian to start acting as a leader in the dog’s eyes. I have found that when a human starts to introduce and regularly enforce rules and boundaries, a dog starts to see them in more of an authoritative light. I suggested a number of simple rules that will help the dog start to a self identify as being in a follower position. My philosophy is to have a a dog relate to its humans the same way that a human child relates to a parent. The child does not respect the human because they dominate or punish them, the child respect the human because they nurture, care for, teach, protect and are there for them. Because the dog got most aggressive when he was sitting on his guardian’s lap, one of the rules that I suggested was to make all furniture off-limits until the aggressive behavior has abated completely. For dogs, the higher that they sit among their peers, the more rank or status they have. Simply keeping the dog off the furniture will go a long ways towards helping Baxter start to literally see the humans as being in a higher position. As I mentioned earlier, I had noticed that Baxter frequently would jump up on his guardian’s lap, scratch her leg or nudge to tell her it was time to pet him. While petting a dog is a healthy activity, if we have a dog that is coming from an unbalanced state of mind demanding that we give it attention – and we consistently follow through, this reinforces the dog’s perception that it has more authority than we do. To help the guardian stop reinforcing this belief, I went over my Petting with a purpose strategy. By asking Baxter to consistently sit, come or lay down in order to earn the affection from a human, we can help him learn to be more obedient and respectful of the humans at the same time. I had also learned that Baxter really didn’t know many commands or tricks. Just like humans, dogs have a sense of pride. I have also found that dogs with lower self-esteem tend to be more reactive. Because Baxter really only knew how to come or sit down, I recommended that the guardian and her husband take turns practicing teaching the dog a new trick every week for the next 4 to 8 weeks. Not only will learning new tricks and commands build up the dog’s confidence and self-esteem, it will also give the husband the ability to take on a leadership role in the dog’s eyes. Dogs build up a sense of respect for humans that teach them this way. I started the guardian off on this new education swing with one of my favorite activities; teaching a dog to Focus. This simple exercise is very effective in redirecting a dog’s attention provided the humans practice it enough with the dog in a calm non-confrontational setting first. I recommended that both guardians practice this exercise with the dog 2 to 3 times a day. Each practice session should last 60 to 90 seconds maximum and always end on a good note. As the dog gets better at it, the guardians can start elongating the second movement to keep the dog’s attention focused on them for progressively longer periods of time. As we were wrapping up the Focus exercise, the guardian’s husband arrived home from work. After catching him up, I pulled out some high-value treats and explained how we can use counterconditioning to help the dog have a positive association of the husband being near or touching his wife. It was great to see how quickly Baxter was responding to this form of positive dog training. I made sure to caution the guardians against taking this for granted. Many people start this process and then when they see immediate results discontinue the counter conditioning exercises itself. The trick is to practice the counter conditioning exercise multiple times a day every day for a week or two while ensuring that the dog has a completely positive training experience. After enough repetitions, the dog starts to associate the action (in this case the husband touching his wife’s belly) with being rewarded. Because they are a couple and this version of counterconditioning will work best with outside help, I recommended that they take advantage of any visit my friends or family members to practice this counterconditioning exercise. Ideally I would like to see the guardians having a third-party hand the dog the treat (or hold it while the dog nibbles on it) while the husband touches his wife. However, the guardians can practice this exercise without a third-party by all sitting on the floor and having the wife hold of the treats for the dog to chew on and then the husband starting to touch her after the dog has commenced. I made sure to stress that the husband needs to stop touching his wife before the dog finishes the treat each time. I also recommended that the husband be the person who feeds Baxter and takes him out for walks as often as possible if not all the time. By having the husband provide food and be the one who takes the dog out for walking adventures, the dog can start to associate him with activities the dog likes. Over time this will help the husband develop a positive relationship with the dog. By the end of the session, Baxter was able to sit on the floor a few feet away while the husband touched, caressed and even kissed his wife. These are all activities that would’ve immediately resulted in an attack from the dog only hours prior to my arrival. If the primary guardian regularly enforces the new rules and boundaries, they practice the focus exercise and teach Baxter a few new tricks and master of the counter conditioning exercise, Baxter’s outbursts and attacks on the husband should become a thing of the past.